As the U.S. economy continues to expand, the response by the FOMC is to slowly raise interest rates in attempt to extend the business cycle as long as possible. This action of ratcheting-up short-term rates is positive for bond yields. After steadily declining since 2008, the U.S. 10-year Treasury Bond yields have found a floor in 2012 and 2016 at 1.50 percent. Yields have since gained ground and have modestly risen to 2.40 percent in recent months. 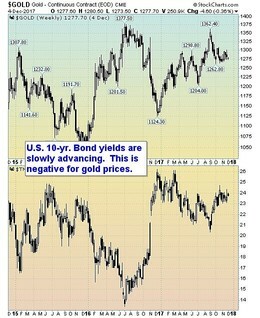 Gold prices, in response, have struggled to advance and remained capped under $1400 over the last four years. In fact, gold prices and U.S. 10-year Bond yields have formed a tighter opposite correlation since 2015. And as the Fed is now on a program to slowly tighten and raise bonds yields to contain the growing U.S. economy, we expect little upside potential for gold prices in the near future. Bottom line: The FOMC is expected to raise the benchmark rate in 2018 to 2.10 percent. As the current rate is 1.00 to 1.25 percent, the projected rate next year is approximately twice what the present rate is. This would suggest the 10-year bonds would advance to about 3.00 percent next year from their current 2.40 percent. 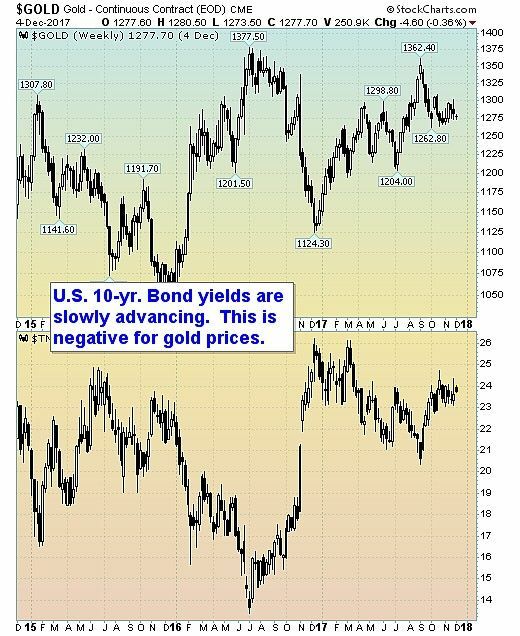 As bond yields and gold have an inverse relationship, the expected increased in the Fed rate next year should keep a cap on gold prices in 2018.